I am a french collector and looking for someone in Spain who could help me to get the new issue (World Year Physics) with the FDC. I also collect topical stamps about physics, I think that I could try get the new issue and the FDC, have you any similar in france? We also could change any stamps. I have just to start this topical, but I have any stamps of Spain repeated. I´m amazed and full of admiration.This collectio of historical physical personalitys.With all the hitorical details.it´s a great work You have macke.Here is My gratitude,to You,for share it with as all. It have take Me a precious time,to see the whole collection,but I real heve enjoy it,very much. Thans dear friend and congratulations. Greetings from the South of Spain,looking to the Mediterranean. Dear friend,I´ve search by all My contact of exchange.Yes to get the opportunity of finding the FDC of Your collection.But,no one of this friends of My,have got this,for You or Me. The only thing,I´ve found is,in Málaga post office,is the sheet of 20 u/n. 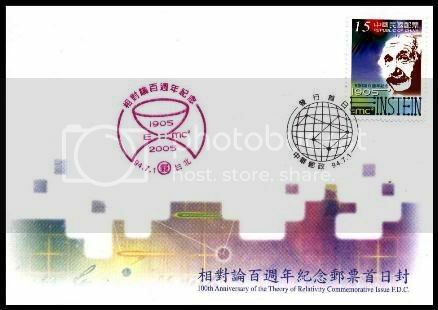 self-adhesive of this stamp "world year Physics". ¿Is this,the only stamp from My Country.You´re interested? I´m saying this,because I do collec stamps(canceleited)from Your Country (France),and I steel need so many.Perhaps You have got the possibility of give Me"a hand",yes to complete My collection. My french collection gos only from the year 1949 to 2005.I´m ussing the Y.et Tellier catalogue to check it by numbers. I be gratefool if You like to answer My suggest. issued on July 1, 2005.